Because of their convenience, ski-in ski-out accommodations are the most popular lodging venues at a ski resort. Indeed, it's hard to resist the promise of having the lifts at your doorstep at the start the day, and being able to ski right to the hot tub when the day ends. However, while this may be ideal for those who covet the first tracks experience, on mountain accommodations are not always the best option for everyone. Do you care about accessibility to activities in the town? Are there non-skiers in your group? Convenience: You don't need to worry about driving to the resort, getting stuck in a traffic jam and finding a parking space. You'll be at the front of the lift line. This is important at destination resorts, which tend to have long lift lines. You can save money by eating in. Many lodging venues have either full kitchens, or mini-kitchens with small refrigerators and microwaves. You can have a drink at apres ski without worry about driving back. If you are taking ski lessons, you have plenty of time to rent your equipment and prepare for class. This is important, since traffic jams and confusion about meeting areas often cause people to arrive at their lesson at the last minute. It can be noisy: On-mountain lodging is popular with people who like to party. If you are one of those people, that's great. However, if you need a good night's sleep, that might not be possible. Limited access to other types of restaurants: While the resort lodge might have some excellent dining venues, in most cases, they rarely match the quality of the local restaurants. If you have a car, this is not an issue. However, without a car, you might have to deal with the same dining choices each evening. Limited access to the non-skiing attractions. This can be a problem if you are traveling with a non-skiing significant other, or if you yourself are interested in seeing other parts of the town. You or your non-skiing friend may also be interested in shopping that does not involve ski clothes or ski gear. You will not be likely to find that type of store on the mountain, though some ski areas have shuttle buses into town. If you are traveling without a car, check to see if shuttle service is available. Pet and child restrictions: If you were thinking of bringing Fido or Junior, make sure that the hotel or condo owner allows this. In most cases, they do not. However, it's usually possible to find inexpensive pet and child-friendly accommodations in town. They lack charm. A bed and breakfast in town may provide a more enjoyable experience for the non-skiers in your party. Cost effectiveness: A two bedroom condo can often sleep up to six people. This is much less expensive than separate hotel rooms. Full kitchens: You can save a good deal of money on food by cooking your own meals. Better amenities: Condos usually have bigger TV sets and other types of audio/visual equipment. Despite their benefits, you should be aware that condo rentals don't always come with daily housekeeping. If that's important to you, check with the owner or management office before you put down a deposit. Also, the package of coffee that's in the cabinet is usually a gift from the owner. Don't expect it to be replenished on a daily basis. In most cases, the easiest way to find slopeside lodging is by going to the resort website. Other people use Craigslist, but you need to be careful. 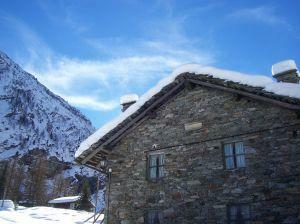 Ski message forums such as Epicski sometimes have a classified section for vacation rentals. Since the forum attracts a steady group of participants, it's usually a safer bet than Craigslist. Vacation Rental by Owner is the web's best-kept lodging secret. You are renting directly from the owner, which means that you are paying less. Depending on your circumstances on mountain lodging may be ideal. Just be sure to consider all options.